Shoemaking and mending was once an important local task in towns and villages throughout the country. Market Lavington and Easterton were no exceptions. A scan through the censuses of the nineteenth century reveals that many men were engaged in the boot and shoe business. Some were called cobblers but more were boot and shoe makers or had a job name specific to one type of shoe such as a cordwainer who made more luxurious shoes. One thing these workers had in common was the use of a last – a heavy metal shape for holding a shoe whilst it was worked on. We have a number of lasts in different shapes and sizes at Market Lavington Museum. The one shown here can be stood three different ways round so that the top or working surface suits three different sizes of shoe. 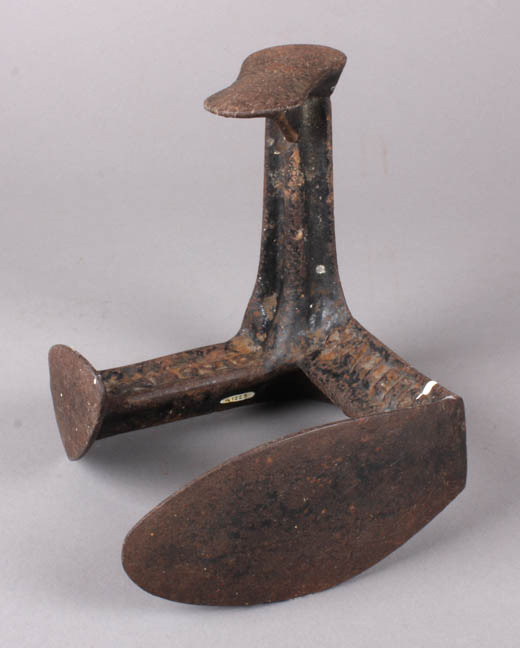 This cast iron shoemaker’s last was made by a company called Bloomers in about 1893. We have mentioned Market Lavington’s last cobbler, Ken Mundy, on previous occasions and some of our cobbling tools, and our wonderful Phillips stick-a-sole man come from his shop. But many of our tools were found in an Easterton cottage once occupied by a cobbler. This entry was posted on July 22, 2011 at 5:28 am and is filed under Museum. You can follow any responses to this entry through the RSS 2.0 feed. You can leave a response, or trackback from your own site. I have my Grandfather’s set of lasts. Would you be interested in them? Jean Barton. Thanks very much for the offer. Do the lasts have a real connection with Market Lavington/Easterton? Our museum only has items with such a connection.